Note: All meetings start at 7 PM at the Falmouth Volunteer Fire Department, 250 Butler Road, unless otherwise noted! The Fredericksburg Personal Computer Users Group (FPCUG) was founded in 1987 by residents of the Fredericksburg, Virginia area to help promote the use of personal computers in our community. We are here to help you with your personal computer questions and problems. 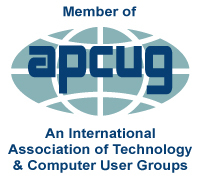 You don't have to be a computer expert to be part of FPCUG. We cater to those who are both beginners and veterans in personal computers. Everyone can benefit from our organization. Click on a highlighted menu topic for more information. Jim Hamilton, Stafford Sheriff Dept. for the Workshop and General Meeting schedule.